Enjoy this super mix of jazz, blues, barbershop, gospel, classical, ethnic, folk and old favorites! This collection features 27 solos arranged with just chord diagrams for players at all levels of ability. Songs include: Aura Lee · Down by the Old Mill Stream · Hard Times Come Again No More · My Wild Irish Rose · Twelve-Bar Blues · Liebestraum · Ja-Da · My Buddy · Sweet Adeline · In the Bleak Midwinter · Memories · Toyland · Dark Eyes · and more. Each solo is preceded by a page of background information with interesting comments about the composers and the songs themselves. Introductory text provides instructions, detailed guidelines, helping playing tips, and useful insights. 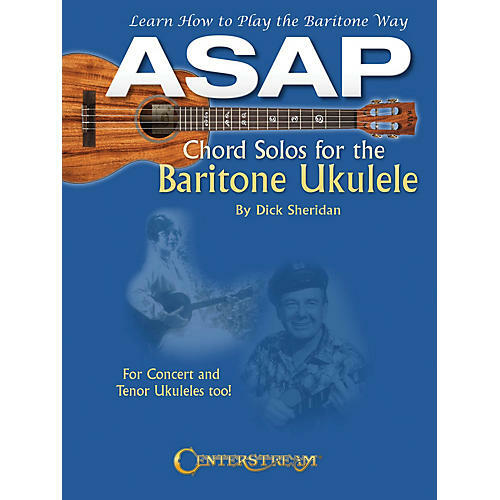 Although intended primarily for the baritone ukulele, many of the solos can be played by both concert and tenor ukes, as well as on the top four strings of the guitar.